One of the challenges in teaching medicine and in particular sub-specialty medicine is the sheer volume of information to be digested. The commonest refrain I hear about studying the discipline of interest, in particular from new trainees in medical oncology, is ‘I don’t know where to start’. There are many potential approaches. There is the traditional basic science to clinical science approach. For example starting with the relevant biochemistry, anatomy, etc and building up towards practice. There is the problem-based learning approach which is good for clinical scenarios but perhaps doesn’t encourage an understanding of depth. Another approach applies templates to diseases. For example if we consider breast cancer one can think about the epidemiology, screening, prevention, adjuvant treatment and treatment of recurrent disease. The same template could be applied to each cancer type. There are common themes and also variations and differences between each cancer….but the basic themes are the same. Arguably the latest approach is that of looking at the Hallmarks of Cancer as proposed by Hanahan and Weinberg in Cell (2000). The authors propose that there are key characteristics that cancers acquire that distinguish themselves from non-cancers. Although there are some criticisms that some of the hallmarks also apply to benign tumours, broadly speaking the concept provides a useful way for thinking about how cancers behave. I think Hallmarks of Cancer is a useful framework for teaching oncology. 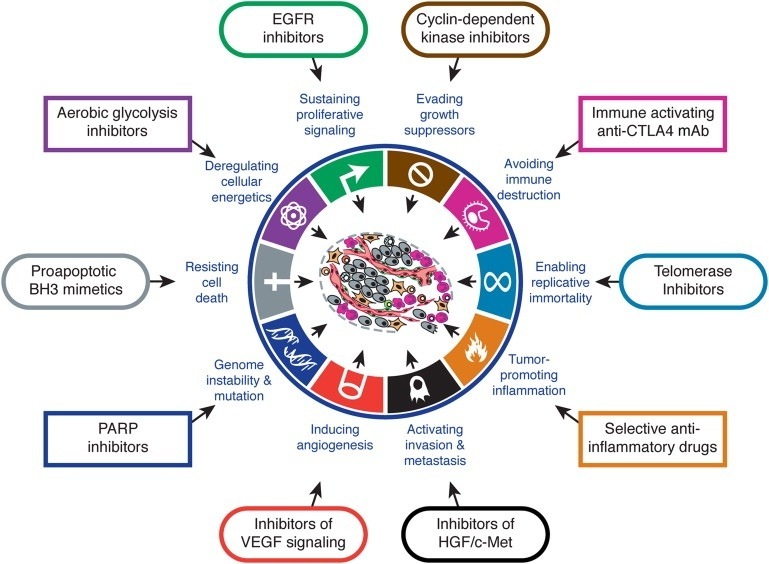 What makes it useful if that you can think about high level concepts such as sustained angiogenesis or evasion of immunoregulation or self-sufficiency in growth signals or any of the hallmarks as having potential for application across the spectrum of oncologic interest: the hallmarks inform aetiology, diagnosis, prognostication, and potential treatment strategies. It provides a framework that facilitates both understanding complexity and engaging reductionism. It is the view from the plane that lets us know the concepts but enables closer examination. Trainees need to familiarise themselves with The Hallmarks of Cancer and apply it to their studies. I completely agree. As a med student, I am often amazed by the magnitude of information out there (I am equally amazed at how people studied medicine before the internet and electronic sources). While I am not planning to go into oncology I do believe that The Hallmarks of Cancer does give a useful framework and I used parts of it on occasion.